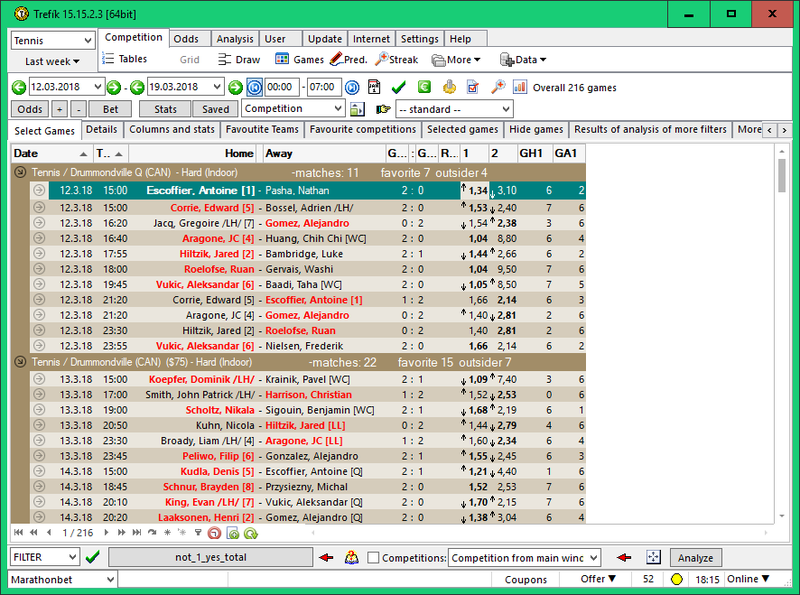 Find tennis matches where the favorite lost the first set, but won the entire match. 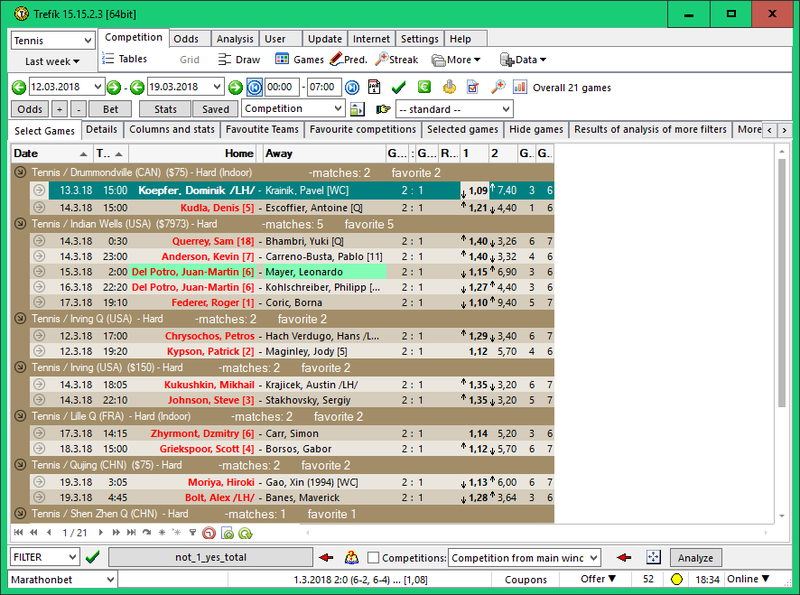 This analysis can be used to bet the favorite to loose the first set, but in the entire match win. 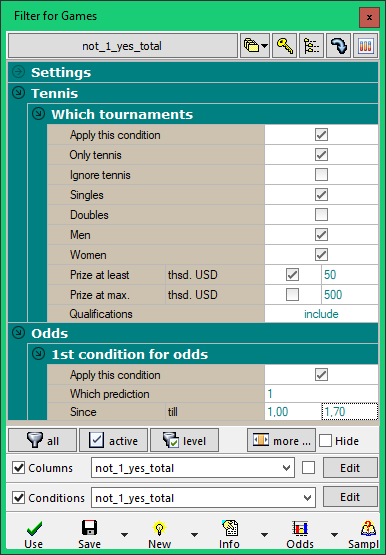 There is typically much higher odds on such a bet then on standard favorite winning in the match bet. We can find a players who although being favorite of the match has usually a slow start and lose the first set. 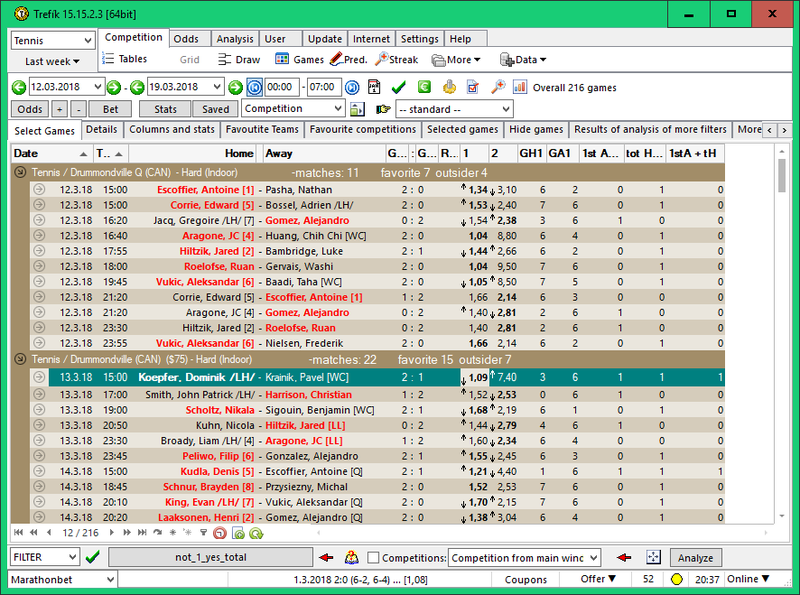 This task is solved in the window List of odds the best. Here we can set the period that we want to analyze. On the figure there are matches from the previous week. 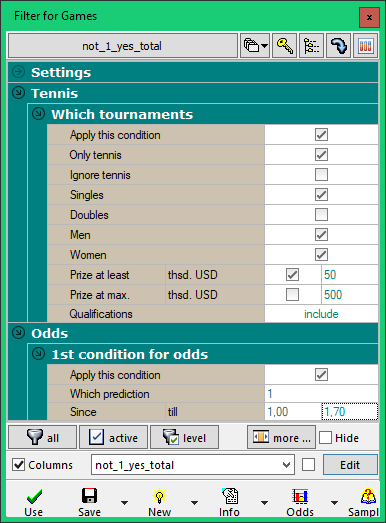 To analyze the favorites in tennis, it is necessary to have favorites stated as the first in all matches in the windonw List of odds. 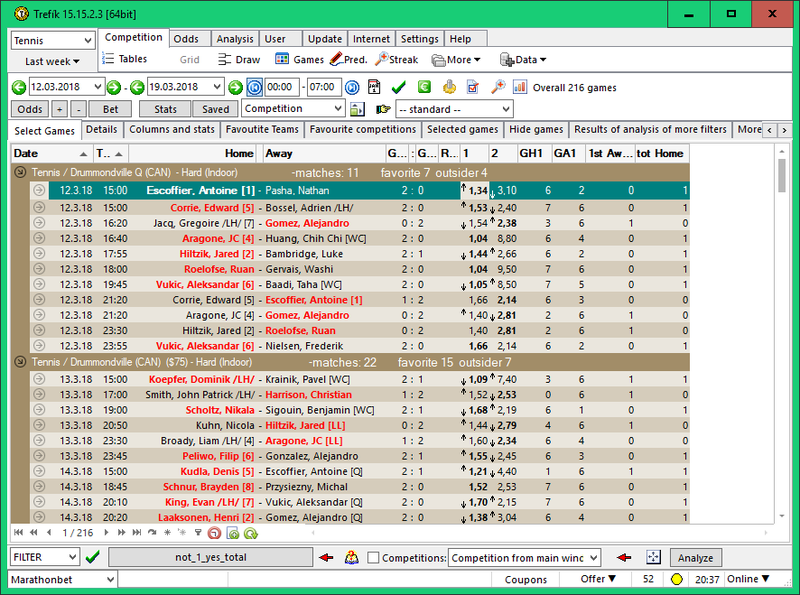 By default, the home player is stated the way as it is done by the the selected betting company. 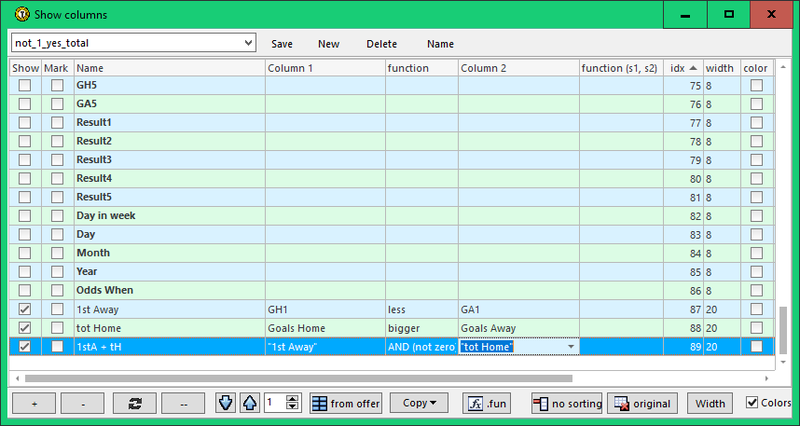 We must activate an item for a favorite to be stated as the first player (= "home") in matches in section Settings. In section Tennis we will define that we are looking only tennis matches of both men and women, singles and only just in tournaments with a prize money at least 50 000 USD. 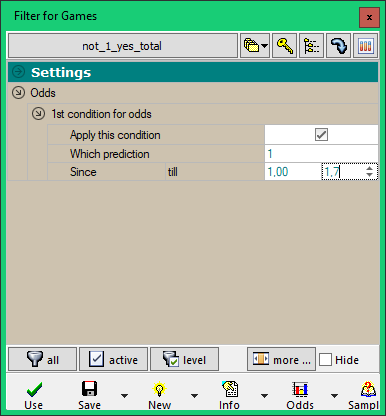 In the last section we will use this time - Odds may be defined what should be a odds on tip 1, it means on the player stated as the first, which means in our case on the favorite. 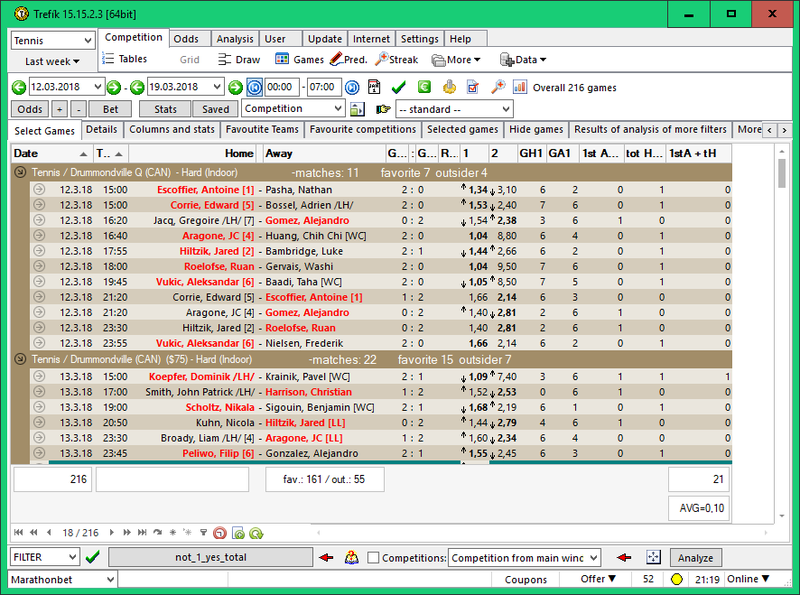 .. we need to activate the columns GH1 and GA1 which are the results of the first part of the game = the result of the first sets in this case. 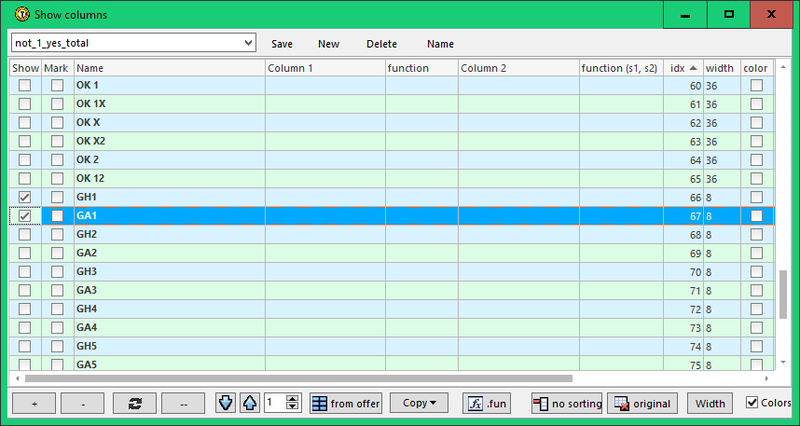 ... using the PLUS button on the bottom left, we created two new columns. 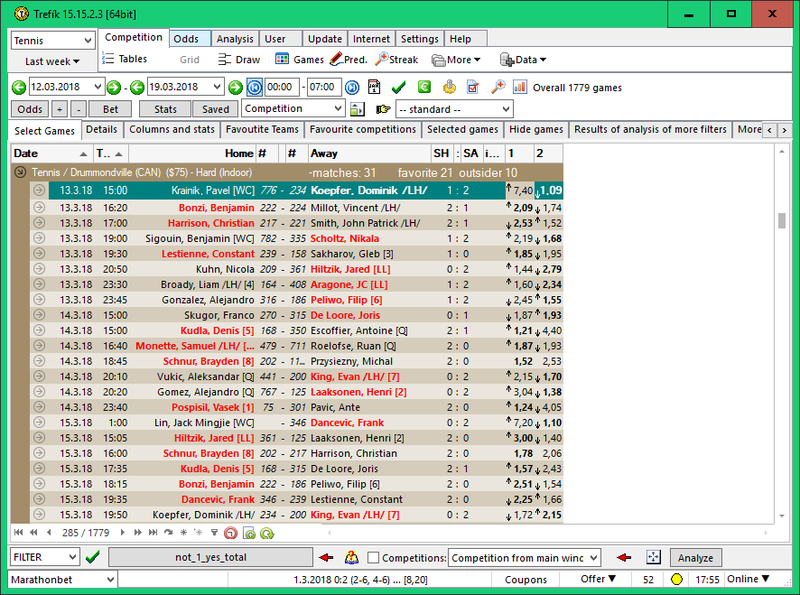 The "1st Away" will have a value corresponding to the result of the "less" function, so it will be 0 or 1 depending on whether the guests have won the first set (= 1, because in that case GH1 is less than GA1). 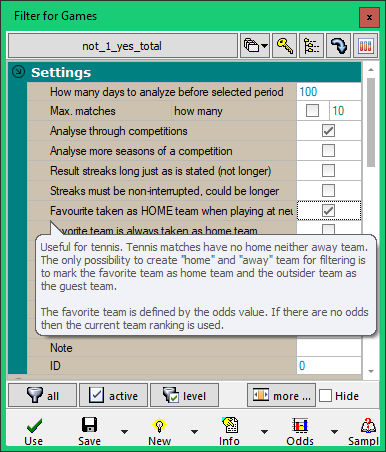 The second new "tot Home" column is the result of the "bigger" function and gets 1 if the home team wins the match; otherwise it has a value of 0. .. we will create another new item (= column): "1stA + tH", meaning "1st Set Away, Total Home". 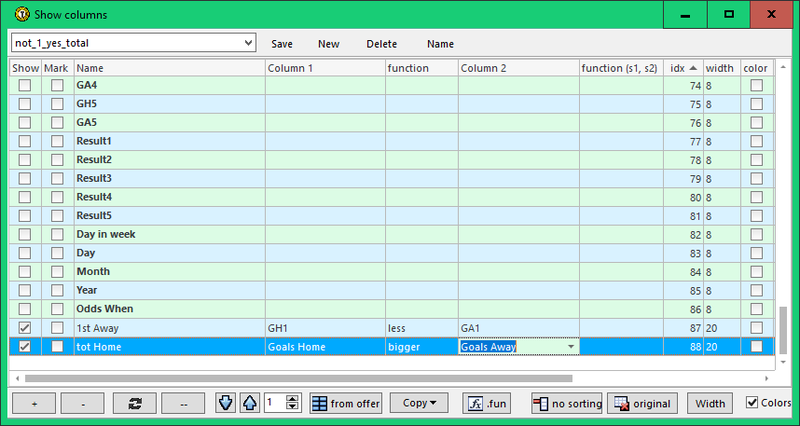 This column will have a value corresponding to the result of the AND (not zero) function, that is, it will be 1 if the two columns being compared are nonzero; otherwise it will be 0. This column will be 1 if the match meets our specifications. .. so we can see that the favourites loosing first set won the whole matches just in 10% of the past matches.